Born on this day in 1944 is car enthusiast and drummer for Pink Floyd, Nick Mason. 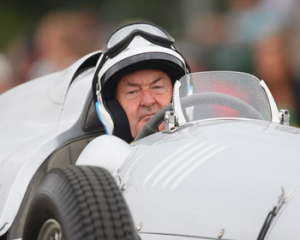 In addition to being a member of one of the most famous arena bands of all time, Nick Mason is an avid car lover and racecar driver. Nick has competed in the 24 Hours of Le Mans five times, with a best finish of 18th in 1979 as part of a team driving a Lola T297. Since then, Mason has returned to the Le Mans Classic in his Ferrari 250 GTO, and is a frequent presence at the Goodwood Festival of Speed. Mason is also an owner in the company Ten Tenths, a company founded on Nick’s own private collection that has expanded to include a network of classic auto enthusiasts and their cars as well. The primary purpose of the company is to provide vintage automobiles to the television and movie industry. If you’re a fan of both Nick’s musical work and automobiles, you’ll want to try and track down the out of print 1992 documentary (on VHS) recounting Mason’s and fellow band mate David Gilmour’s participation in the historic La Carrera Pan Americana. Pink Floyd’s La Carrera Panamericana is currently uploaded to YouTube in its entirety as well as in various clips. This entry was posted in Events, History and tagged 24 Hours of Le Mans, Ferrari 250 GTO, La Carrera Panamericana, Lotus, Nick Mason, Pink Floyd, Ten Tenths. Bookmark the permalink.